Information: A Cloud session can be also terminated in the online Cloud Console. A running session must be selected before clicking on the Terminate the session button. The session is terminated after clicking Yes in the warning dialog. 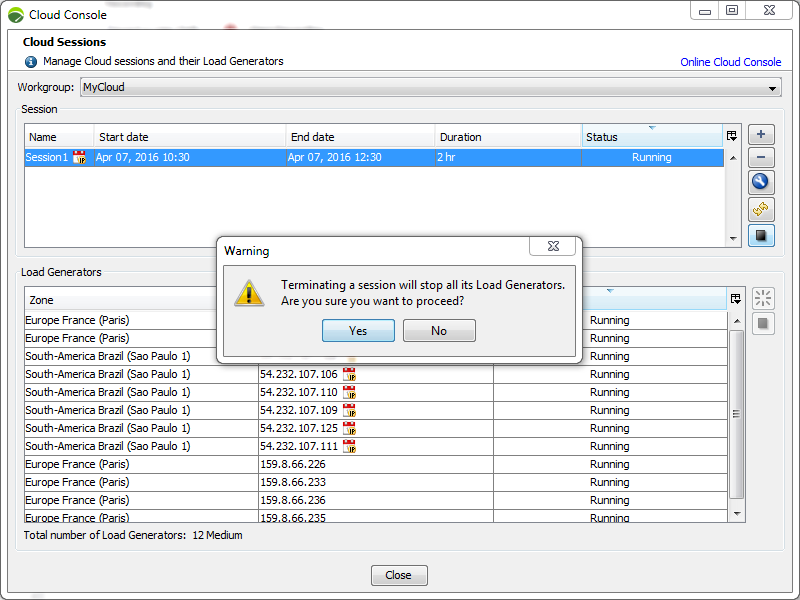 All the Load Generators are stopped and the session is stopped permanently. Terminating a session before the end specified brings some Cloud credits/VUHs back only when the session is terminated more than one hour before the specified end. Information: A starting or initializing session can be cancelled with the same button. No Cloud credit/VUH is used. In the NeoLoad Controller, click on the Open Cloud Console toolbar button. If prompted, connect to the Neotys Cloud Platform. In the Cloud Console, select a running session, and click Termintate the session.